Knowledge Base Subscribers: Individuals who have subscribed to receive emails for the newly published articles. Article Subscribers: Individuals who have subscribed to receive emails on the update of existing articles. Go to "Subscribe as Knowledge Base" section which is available in the footer section of front-end knowledge base. Enter your email ID and click on "Subscribe" button to open "Subscribe Me" page. Fill in the form and click on "Subscribe Me" button to subscribe to the knowledge base. Open article in front end area. 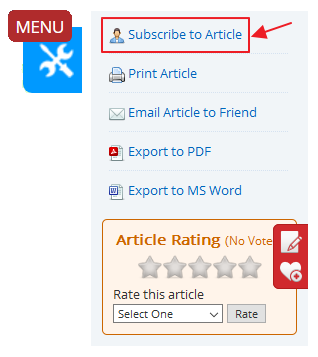 Click on Menu button at the right side of article page and select "Subscribe to Article" option. This menu is available only if Theme1 is selected under Article Page Theme available under Feature Settings. Click on Subscribe Me button for completing the subscription process.